After the briefing on Friday afternoon or on Monday afternoon you will leave our harbor at "De Nauwe Greuns" in Leeuwarden, your first sail a little on the Van Harinxmakanaal, here you can get in touch on this wide canal with the boat. The journey leads in southern direction, following the "Standing Mast Route" to Grou. After about 1.5 hours sailing you reach this convivial watersportvillage for the first night. The following day the trip goes via Akkrum and small waters to Joure (Douwe Egberts coffee roasting). Stay the night in the well-kept marina near the center. Along two small lakes (Langwarden Wielen, Tjeukemeer)the route runs southwards to Lemmer, a dreamy harbor on the IJsselmeer. Just before the big lock turn towards the center and take a berth. For the next day Stavoren is our destination. On the way you pass Sloten (the smallest town in Friesland) and Woudsend, both places invite you to have a break (for Koffie or Patat). 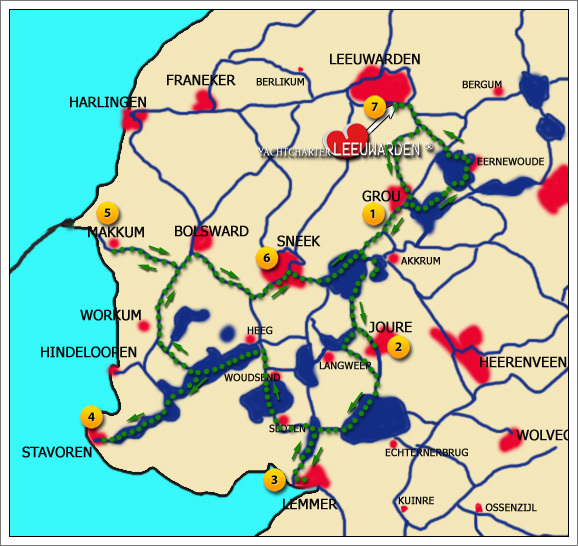 The next stage destination is Makkum, the third Ijsselmeer port on our route, via the Heegermeer past Workum, then on the Workumer TrekVaart, we proceed towards the north to spend in Makkum (centrally in place) the fifth night. Last day it leads direction north, on the Sneekermeer, past Grou with a trip around the nature reserve "Alde Feanen" back to our base, where you spend the last night of your cruise. The Easy Friesland route is a very varied route and suitable for beginners. The Friesland route is a very varied and nice route. A week and boating in the provinces of Friesland and Groningen. Two weeks trip in the provinces of Friesland, Drenthe and Overijssel. Enjoy a short week in northern Friesland, even suitable for beginners. Visit South-West Friesland, nice cruise, even suitable for beginners. Weekend boating in the North of our beautiful province. Visit Bolward and Sneek, enjoy a nice weekend in Friesland. Enjoy Grou, Sneek or Langweer, nice weekend in Friesland. Friesland cruise, one week, most watersports places in Friesland within 7 days. Cruising Friesland - Groningen, vertical clearance 3.60 meters. Three provinces cruise, 1 week Friesland, Groningen and Drenthe. Boat vacation in Friesland, one week sailing, Boating holiday by Yachtcharter Leeuwarden - Dutch Yacht Charter, Boating holidays an Netherlands inland waterways. Weekend Boating Holiday in the Southwest of Friesland: Sneek - Bolsward - Franeker - Leeuwarden. Boating one week in Friesland, Sneek, Heeg, Lemmer. Boat vacation in Friesland, one week sailing.. Looking for Hire company Yachtcharter Leeuwarden. 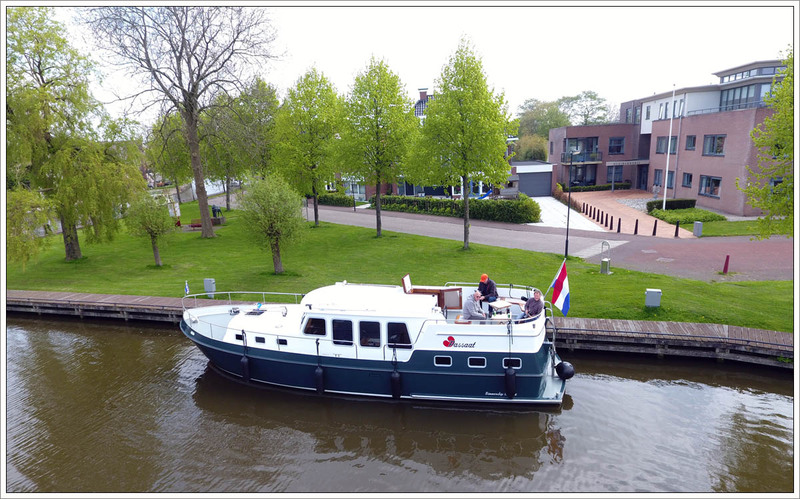 Cannel barges hire, narrowboat,Cannel cruise on dutch inland waterways, Boating holiday by Yachtcharter Leeuwarden - Dutch Yacht Charter, Boating holidays an Netherlands inland waterways. 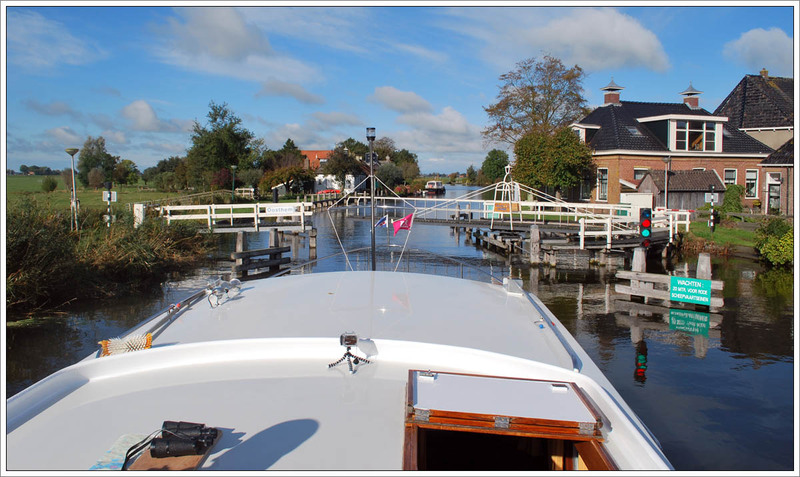 Boat vacation in Friesland, one week sailing, Boating holiday by Yachtcharter Leeuwarden - Dutch Yacht Charter, Boating holidays an Netherlands inland waterways. Weekend Boating Holiday in the Southwest of Friesland: Sneek - Bolsward - Franeker - Leeuwarden. Boating one week in Friesland, Sneek, Heeg, Lemmer. Boat vacation in Friesland, one week sailing.